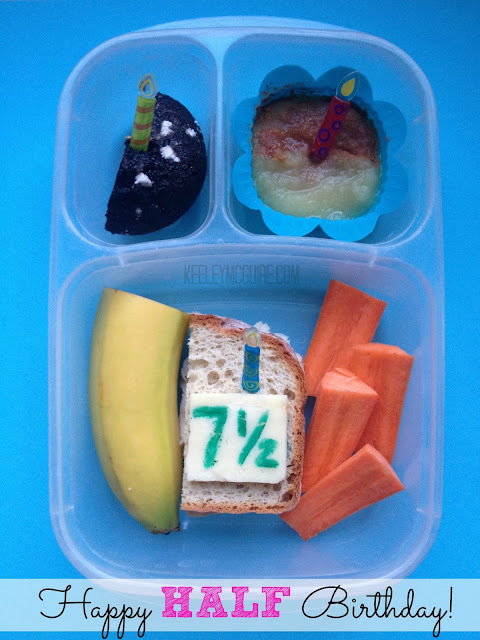 This week we had a variety of fun themed school lunches - From Easter to Leftovers and even a Half Birthday! 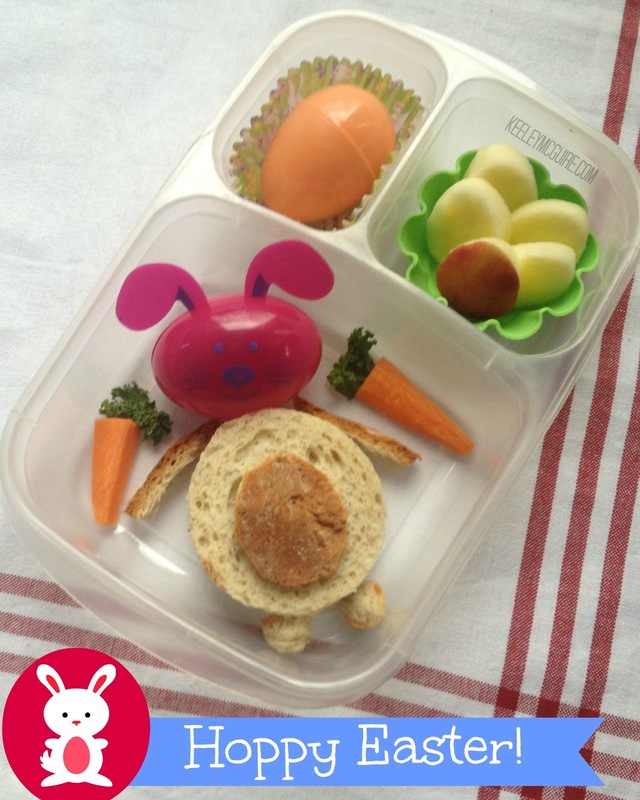 Even though this lunch may look complicated, it was actually VERY easy! Using our Udi's gluten, nut, soy, & dairy free bread, I used pieces of crust for the Easter Bunny's arms and rolled additional scrap pieces into a ball for his feet. The body was cut out with my egg shaped cookie cutters. The sandwich is filled with SunButter & jelly. The head is a bunny shaped egg I purchased in a pack at the Dollar Tree. He's filled with raisins. Beside the bunny are carrots with kale used for the greens. In the top left is a plastic Easter egg filled with additional carrot bites, and top right are egg shaped apple bites. I soak my apples in apple juice to keep them from browning. This lunch is dairy, nut, gluten, & soy free. Use a different brand of bread, such as Ener-g, to keep it egg free and Top 8 Free. 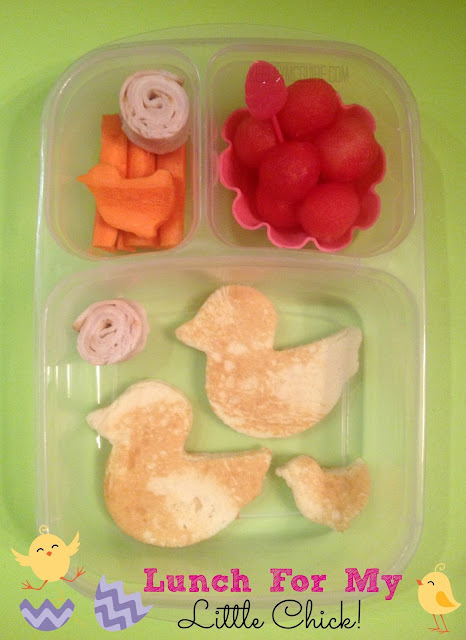 Tuesday's lunch featured some spring time fun for my Lil' Chick! ;) Using my cookie cutters, I sliced this little family of chicks out of pancakes. King Arthur Flour Gluten Free Pancake Mix is made in a Top 8 Free facility. She also has watermelon balls, carrots, and two turkey rollups. This lunch is top 8, gluten, nut, dairy, soy, and egg free. 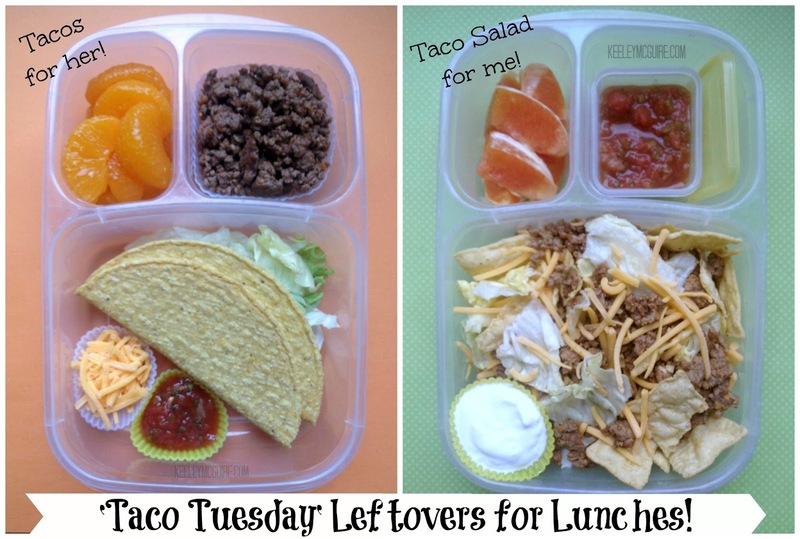 "Taco Tuesday" dinner leftovers made us both fabulous lunches on Wednesday! Little Miss has gluten free corn tortilla shells for a "build your own taco" lunch. Sub the cheese for non-dairy rice or soy cheese for dairy free. She also has mandarin oranges, one of her favorites. I used my leftovers for a taco salad with a cara cara orange on the side. Thursday was Little Miss' HALF Birthday! So we decided to have a little lunch time fun. ;) She has HALF a turkey sandwich on Udi's gluten, nut, soy, & dairy free Whole Grain bread, carrots cut into HALF sticks, HALF a banana, HALF a MOMables Allergy Free Chocolate Beet Muffin, and a cup of applesauce HALF plain, HALF cinnamon. 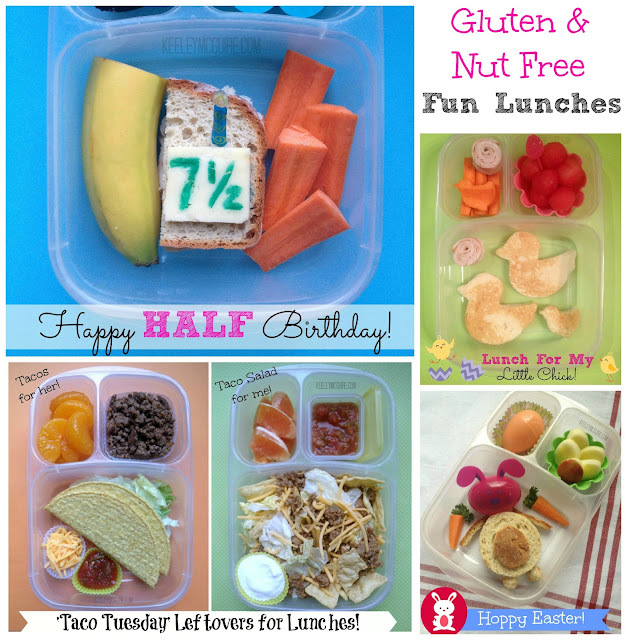 All of this weeks lunches were packed in our EasyLunchboxes container. 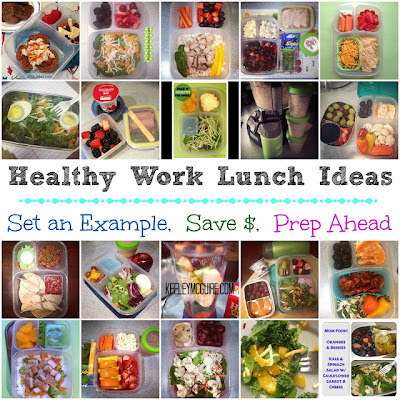 Looking for healthy lunch ideas for Mom & Dad, too? Check out this post! I loved this and really glad that I found it. Just spent a few hrs at the hospital with my son (he's 3) as I just learned that he has a nut allergy. He sneaked a piece of candy with hazel nuts the little turd. Where can you buy things that are nut free? I have to change everything he eats and carry an epi pen around with me now. This is a whole new world and I am not sure where to start.